A major solo exhibition of new and recent work by the New York-based artist whose work speaks to the impact of international politics on individual lives. During the invasion of Iraq in 2003, the College of Fine Arts at the University of Baghdad lost their entire library from looters who set fire to the collection. More than 70,000 books were reduced to ashes. Fifteen years later, students at the college still have few books from which to study. 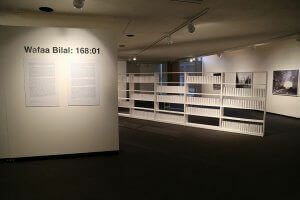 In 168:01, Wafaa Bilal has constructed an austere library containing 1,000 empty white books. The white library serves as both a monument to the staggering cultural losses endured throughout Iraq’s history, as well as a platform for its rebirth. Aimed at restoring the college’s lost archives, 168:01positions viewers as potential participants whose contributions fund educational texts from a wish list compiled by students and faculty. As the installation accrues donations, the blank books are replaced with new ones and the library’s shelves become saturated with knowledge and vibrancy. Select donors receive these books in return for their contribution and as a symbol of the void they have helped to rectify. At the end of the exhibition, all donated texts will be shipped to Baghdad. In this way, the white library activates a system of exchange connecting its visitors in Canada and beyond to the College of Fine Arts in Iraq. Iraq has a long history of cultural destruction. During the Islamic Golden Age in the 13th century, an invading Mongol army set fire to all the libraries of Baghdad, including the famed House of Wisdom, or Bayt al-Hikma. Legend describes the invaders throwing the Bayt al-Hikma’s library into the Tigris River, creating a bridge of books for their army to cross. The pages bled ink into the river for seven days, at the end of which the books were drained of knowledge. For Bilal, 168:01 refers to the first moment when grief is transformed into a call to action, signalling the struggle to move forward from the ashes of ruin. 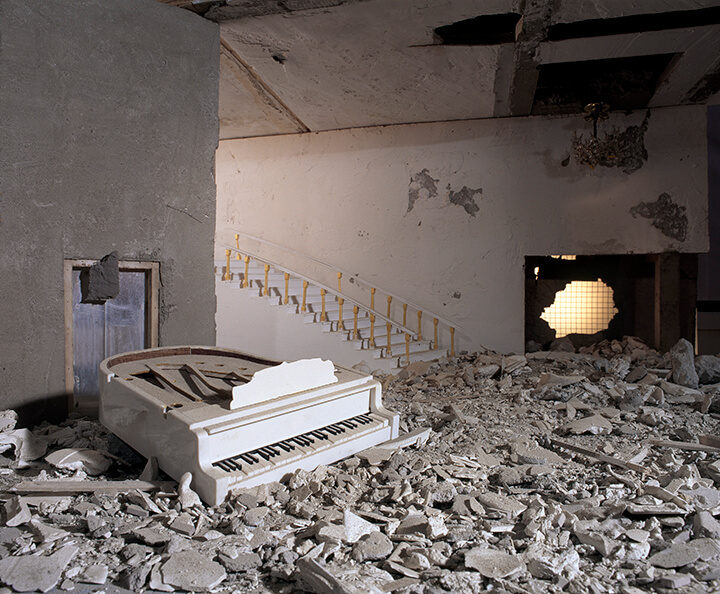 In conjunction with the library, Bilal presents The Ashes Series, a powerful suite of photographs that depict reconstructed media images of the destruction caused by the Iraq War. Composed over the course of ten years, The Ashes Series portrays painstakingly detailed, miniature reconstructions of original press photographs. Each set is scattered with twenty-one grams of ashes and rephotographed in medium format. The reconstructed images immerse its viewers in landscapes whose haunting quality resensitizes the viewer to its entrenched power of loss. These once bustling cultural spaces bear witness to the stark absence of human life, whose renewed presence is represented by the viewer’s arrival to its suspended aftermath. 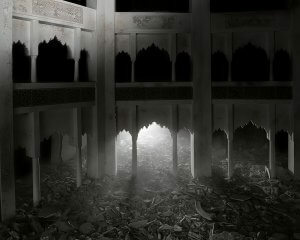 As in the white library, Bilal seeks to activate a state of encounter between viewers and the image. This exhibition invites you to participate in 168:01and join the international network of individuals whose combined efforts share momentum towards building a brighter future of possibilities. The exhibition is curated by Srimoyee Mitra and organized and circulated by the Art Gallery of Windsor.